Widow with very old mother to take care of, Veera Mani never gave up hope against the myriad challenges of life. 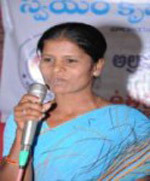 Targeted as ultra poor, SKS helped her in transformative livelihoods with a small goat bank. In 12 months she could successfully diversify her livelihoods base, plowing back the income and micro savings out of sale of goats. She has now a coin box operated telephone booth, is a volunteer in ASA HIV Programme and is also Helper in local Anaganwadi (child nutrition school). She has vision to graduate herself as an entrepreneur with multitude of goats as stock alongside "provision shop” attached to the Telephone Booth. Incidentally she is also learning the ropes to become Bare Foot Health Scout in SKS Ultra Poor Programme. No doubt she is graded as Fast Climber! !